This residence, located in beautiful metropolitan Seattle, sits overlooking the Puget Sound, and has 2,879 square feet of in-floor radiant heating featured throughout the home's three floors. 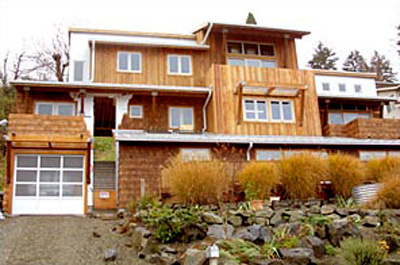 With sweeping views of the Sound and Olympic Mountains, quality construction and attention to detail was a must. Exquisite wood construction is detailed both inside and outside the home complementing the Northwest landscape. Large glass windows provided the view and required a large heat output to meet demand. Would you like to learn more about installing radiant heat in your home? Get in touch. The hydronic heating system is composed of Viessmann Vitola 200 electronically ignited boiler supplies 140,000 Btu's that provides warmth and comfort to the home. The stainless steel 3 pass boiler provides quiet and reliable operation all year long while ensuring the highest efficiency in a non-condensing boiler. The home's three floors are each on a separate manifold system that allows for optimum performance and control of heat distribution. Stadler Climate panels, Stadler 10mm Pextron, SBK manifolds and fittings result in a state of the art heating system that is virtually maintenance free. The Tekmar Outdoor Reset Strategy uses a microprocessor-based outdoor reset control to dictate the operation of the boiler and the mixing valve. This will increase the comfort of the system, while eliminating excess fuel consumption. 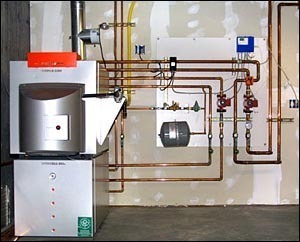 The domestic water system provided by a Viessmann CHA-53 indirectly fired 53-gallon domestic water heater for lifetime maintenance free operation. The mechanical system was built and installed by Northwest Mechanical, Inc. but the Stadler Climate Panel used as the floor heating system was installed by the owner -- with materials, technical assistance, and design provided by Northwest Mechanical, Inc. 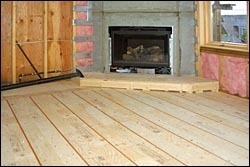 This floor is covered by a variety of finished floor choices from carpet to stone and hardwoods. With the owner installing the climate panel he was able to allow funds for using the best components the industry offers in the system.